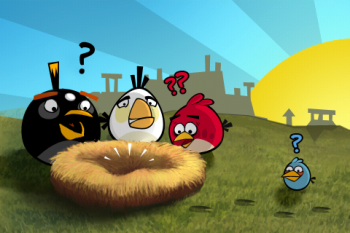 Rovio reported 6.5 million downloads on December 25th. My mother knows what Angry Birds is yet she doesn't have an iPhone, or ever picked up a game controller. That's how ubiquitous the quirky puzzler has become, and weirdly enough there doesn't appear to be an end to its popularity. After an announcement earlier this year from Rovio stating Angry Birds reached a 500 million download milestone, the Finnish company come out today to say that more than 6.5 million people downloaded the game on December 25th, 2011. To put that in perspective, 6.5 million is about how many new cell phones were activated that day. Did every one of those new owners immediately buy Angry Birds? Looks like it. "We're really excited to have such a massive number of new people get acquainted with Angry Birds over the holidays - we have exciting new releases lined up for 2012, and can't wait to introduce them to the public," said Ville Heijari from Rovio. Of course, the 6.5 million combines downloads from all three titles - Angry Birds, Angry Birds Seasons and Angry Birds Rio - and not all of them were purchases, but that figure is up from last Christmas' 2 million downloads. I just got a fancy new Android phone. Should I finally try this crazy game? Everyone is doing it ... Nah. It's just a fad.